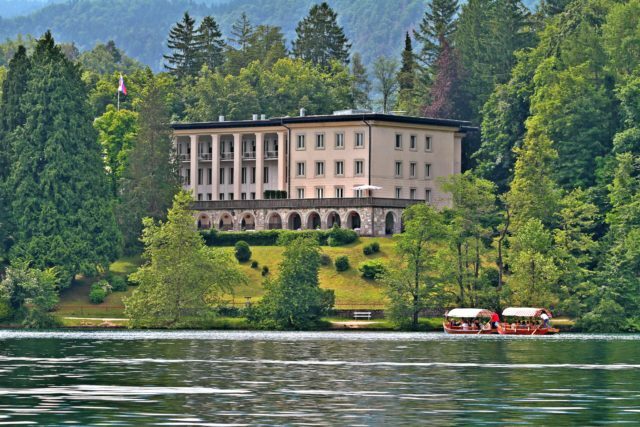 Vila Bled lies in a majestic park right on the shore of Lake Bled and has been classified as “Best Slovenian Hotel 2018”, reference to TripAdvisor. A myriad of entertaining teambuilding activities are available in Bled and the surrounding area, such as hiking, mountaineering, cycling, golf, rafting, canoeing, climbing, riding, hot-air ballooning, white water adventures, treasure hunts, a visit to the nearby high rope course, winter skiing and cross-country skiing and many more. The special historic charm colors the atmosphere which is present at the Vila Bled. The villa was constructed in 1947 on the site of a former royal summer home and served for decades as one of President Tito’s residences before being turned into a boutique 1950s-style hotel. Nowadays it is still full of nostalgia and a synonym for hospitality and culinary experiences. The Vila Bled’s restaurant offers culinary delights that will impress even the most demanding guests. Experienced team of chefs prepare delicacies from the classical Slovenian, French and Mediterranean cuisines, best Slovenian wines and the highest level of services suitable for the state protocol events. Bled is about 45 minutes from Ljubljana and 25 minutes from the main Ljubljana airport. 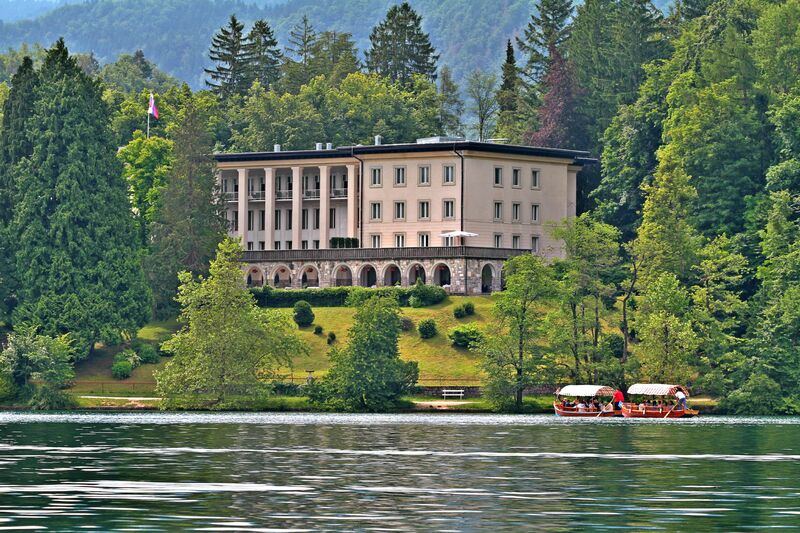 Vila Bled is situated at the main road Bled – Bohinj and is very easy accessible by car or bus. Vila Bled has it’s own parking for hotel and congress guests. The Hotel Vila Bled offers a total of 31 suites and rooms and accommodates up to 66 guests, elegantly furnished in a style reminiscent of the 1950s. The Vila Bled offers two conference halls for organisation of high-level business meetings, receptions, incentive and other events. Social gatherings can be held in the hotel restaurant, on the open-air terrace or in the Belvedere Pavilion with the most beautiful view of the Lake Bled. Vila Bled is located outside the city center of the Slovenian alpine resort of Bled and therefore provides a private atmosphere for the most noteworthy events, both business and private nature. Surrounded by a spacious park and with the best view of the Bled’s island and the castle. The hotel has direct access to the lake shore with its own private beach and a boat house. To walk to the centre of Bled town takes about 15 minutes. Bled is renowned for its magnificent lake, which is embraced by a necklace of Alpine peaks. The highlights of Bled include a ‘pletna’ boat ride to the island direct from the Vila Bled’s pear, a visit to the cliff-top medieval castle a piece of the mouth-watering Bled cream cakes. Vila Bled boasts the exceptional Concert Hall, which features a fascinating mural depicting the Yugoslav struggle during WWII. The hall has direct access to a lake-side terrace and is a wonderful venue for meetings of various kinds, as well as gala dinners. Social gatherings can be held also in the hotel restaurant, on its magnificent terrace or at the Belvedere Pavilion, which was designed by Jože Plečnik, one of the greatest Slovenian architects, as the reception area of a new royal residence. Nowadays, it makes an unsurpassable setting for a standing reception with the most beautiful view across Lake Bled and the island.